Army investigators suspect drugs played a role in the death of a 16-year-old girl found unconscious with another teenage girl at a closed barracks, a spokesman for the investigation said Wednesday. The incident happened last weekend at Fort Lewis near Tacoma, Washington, as the girls were visiting an acquaintance at the barracks, which are closed to the public, according to Chris Grey, a spokesman for the base’s Criminal Investigation Command. Investigators have “received information that this is related to drugs,” but he would not elaborate, Grey said. He would not say if toxicology reports of either girl had been completed. Emergency personnel from the base responded to a 911 call about 3:30 a.m. Sunday and found the two girls in one of the barracks. A doctor declared one of the girls dead on the scene, and the second girl was transported to Madigan Army Hospital where she was in stable condition on Monday. There were no signs of trauma on either of the two females, Fort Lewis spokesman Joseph Piek said. Investigators questioned a soldier who was “allegedly an acquaintance” of the girls, according to Piek. No arrests have been made. Fort Lewis is not releasing the name of the soldier or the two girls, citing the ongoing investigation and the girls’ ages. The Office of the Armed Forces Medical Examiner is conducting an autopsy, Piek said, and it will be at least a week before results are complete. Both girls are from the nearby South Puget Sound area but were not related to anyone living on base, Piek said. Both girls’ families had been notified, he said. 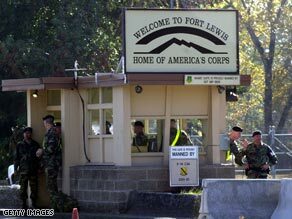 Although Fort Lewis is not open to civilians, they can be escorted in by a soldier living there, and if they have identification and a reason for coming onto the facility. The circumstances of how the girls came onto the base are under investigation, Piek said, but there was no evidence that security had been compromised. There are approximately 30,000 military personnel based at Fort Lewis. Barracks where soldiers live are usually split into rooms for up to three soldiers, Piek said. Details about the barracks where the girls were found were not released.